I always hear about parents who can’t get their kids to eat vegetables. Then they discover soup and everyone lives happily and healthily ever after. Fruit, on the other hand, is something kids already love to eat. So there’s really no justification for making it into a soup. Unless, of course, your world doesn’t revolve around children and you’re just in it for the culinary adventure. I realize now that when my sister-in-law suggested fruit soup as a blog, she was preparing to shake off the shackles of parenthood and head off to the food frontier. Her youngest is just a senior in high school, but she’s clearly ready to feather her almost empty nest. That’s where this week’s soup started. That and a famous Italian hors d’oeuvre—prosciutto and melon. I figured I’d make a foray into the world of fruit soup with something well-known and well-liked. Something that couldn’t fail. But I don’t like melons. Not cantaloupes, not watermelons, not honeydew, none of them, and I was not about to make a soup I was predisposed not to like. This meant my original, familiar, safe idea had to go right out the window. Not wanting to go too far off the path, I stuck with prosciutto and swapped the cantaloupe for strawberries. I had had a friend who’d served prosciutto and papaya as an appetizer and that had turned out well. After all, as much as I don’t like melon, I love prosciutto. The salty tenderness of the Parma ham has a melt-in-your-mouth quality that adds something good to everything it comes in contact with. But fruit soup? What kind of stock would I use? I didn’t want to undercut the strawberries with a savory stock nor did I want to water down the salty flavor of the prosciutto. In the end I went with fruit juice (a cranberry/strawberry/banana blend to be exact), but at first taste, I was sure I’d made a horrible mistake. The sweetness was overwhelming. The ham suffocated beneath a blanket of pureed strawberries. I knew this fruit soup thing was a bad idea. But what could I do? I wasn’t about to compensate for the sweetness with more prosciutto. The stuff cost over $12.00/pound (and that was a cheap domestic knock off). Still I felt sure that savory reinforcement was the way to go. My first salvage effort involved the red pepper and that added a great aroma to the mix but didn’t help the flavor. Next came green onions. Both fit with the freshness of the soup. The strawberries that is. You can’t exactly call cured, salted ham fresh, but anyone who’s ever had thin sliced prosciutto would agree that that’s how it tastes, like Carpaccio or steak tartare. Sadly the vegetables weren’t enough. I needed something stronger to balance out the fruit. I needed more body and that meant extra protein. I tried cheese. Romano to be exact. Perhaps the salty sheep’s milk flavor and the dry grana texture would pull my soup back from the brink. But even that wasn’t enough. Would it taste better warm? How about cold? Luke-warm? Luke-cold?!!! By now I’m getting pretty desperate. Maybe this soup couldn’t be saved. All that prosciutto down the drain. Strawberries too. Of course, I had to serve it to my family. I knew their criticism would flay me, but maybe they’d see something I didn’t. Some redeeming quality I had somehow missed. With dread, I plated (bowled?) the soup up for my wife and kids. Figuring I could at least mask the flavor, I garnished each bowl with a dollop of sour cream. Somehow the sour cream had brought together all the disparate tastes and balanced them into a terrific dish. In the final seconds of the game, I’d thrown up a hail Mary pass and it found its target. The soup was saved. My family liked it too. All except the youngest who usually just picks by dinnertime. She says nice things, but her plate stays full. Nevertheless, the ordeal of the Italian fruit soup had reached its end. Parenthood never ends. It never ends. And all I can say is grazie. Place juice, strawberries and prosciutto in a pot. Puree with an immersion blender until smooth. Add pepper and green onions, bring to a boil and reduce to a simmer for 15-20 minutes. Blend in Romano cheese and adjust seasonings. Serve warm with a dollop of sour cream in the center of the bowl. 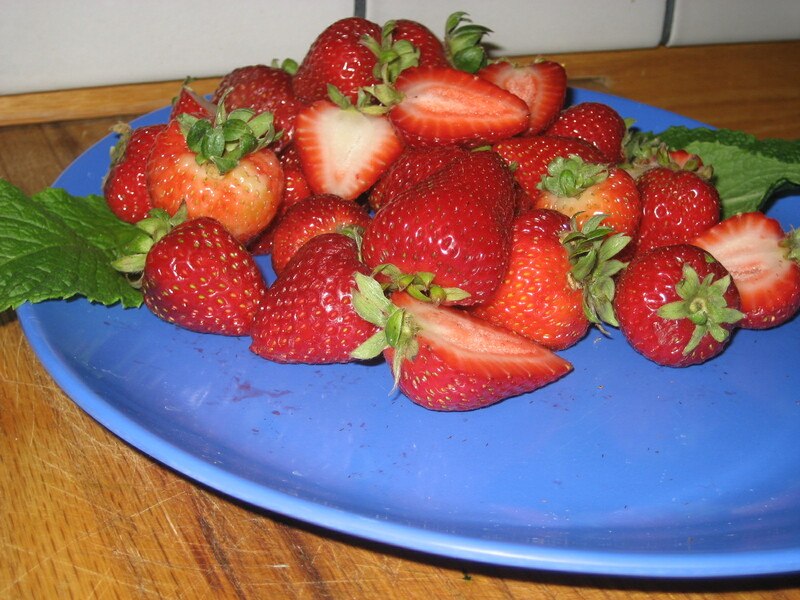 Image Credit: Photo of Strawberries by my niece Clara, the art student from California, which is why there is more balance and intelligent composition than usual. I showed my appreciation by letting her eat them. What are your experiences with fruit soup? With parenting? Anything unusual you’d like to share? Put them in the comments section. I’ll be reading and responding.